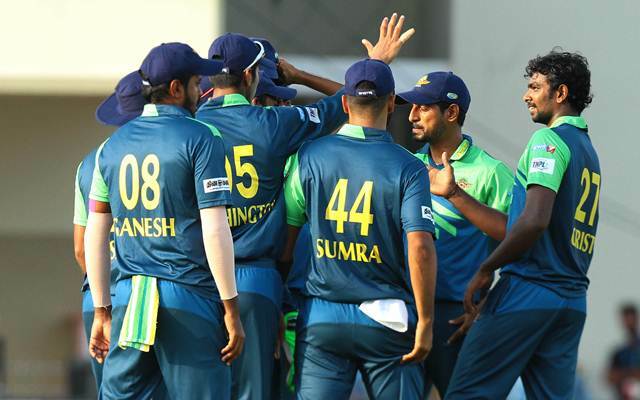 Jones Tuti Patriots registered their second win in as many matches in the 2018 Sankar Cement TNPL when they beat Lyca Kovai Kings by 11 runs at the NPR College ground in Natham (Dindigul) on Friday, July 20. Put in to bat, Patriots began cautiously and accelerated the run rate once the openers settled down. Skipper Kaushik Gandhi, who scored a century in the previous match, was dismissed for 43(25b) after two reprieves. Patriots’ left-handed opener S Dinesh 59 (42b, 3×4, 4×6) dominated the bowling by playing strokes all around. His 55-run partnership for the third wicket with Akshay Srinivasan 45 (21b, 5×4, 2×6) took Patriots to 144 inside the first 15 overs. However, Kovai Kings pulled things back in the death overs to restrict Tuti Patriots to 182/7. Kovai Kings needed their in-form openers to step up but both skipper Abhinav Mukund and Shahrukh Khan failed to stay long. Akkil Srinaath kept Kovai Kings’ hopes alive before he fell hit wicket for 35 (20b, 1×4, 4×6). R. Rohith (25, 11b,3×6) ignited the chance of a miraculous win before pacer Athisayaraj Davidson dismissed him to seal the game. Davidson and Akash Sumra snared three wickets each. This was Kovai Kings’ second defeat in three matches. Jones Tuti Patriots in 182/7 in 20 overs (S Dinesh 59, A Srinivasan 45, K Gandhi 43, Ajith Ram 2-27, MP Rajesh 2-31, T Natarajan 2-34) bt Lyca Kovai Kings 171/8 in 20 overs (A Srinaath 35, R Rohith 25, A Davidson 3-35, A Sumra 3-32).